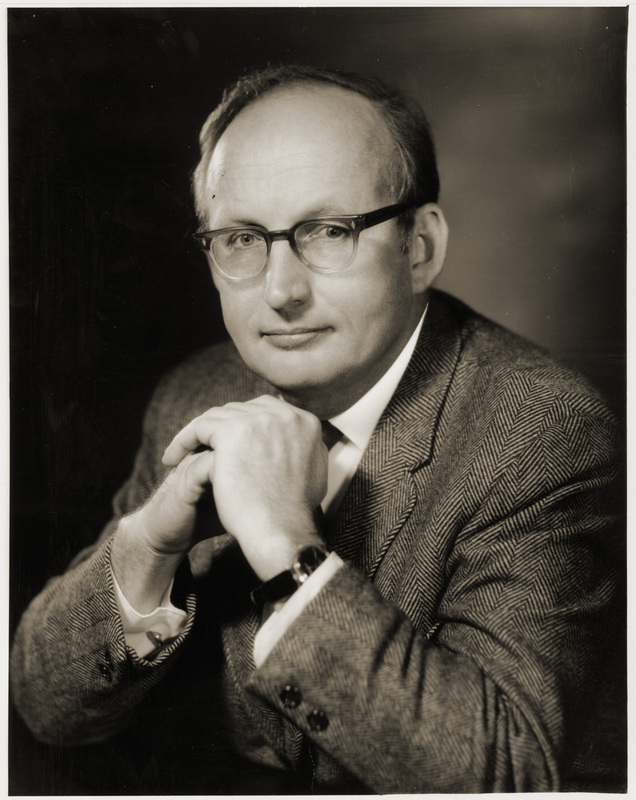 A distinguished political scientist, specialist on urban affairs, and advisor to two U.S. Presidents, Robert Coldwell Wood was named in 1970 as the first President of the new University of Massachusetts system. The son of a shoe salesman and school teacher, Wood was born in St. Louis on Sept. 16, 1923, and raised in Jacksonville, Florida. Although his undergraduate work as a scholarship student at Princeton was interrupted by wartime service in Europe with the 76th Infantry, he returned to his studies with great energy, completing his BA in 1946, followed by three degrees from Harvard in quick succession, capped by a doctorate in government and political economy in 1949. Focused the problems of urbanization and state and municipal governance, Wood straddled the worlds of public service and academia from early in his career. While still working on his doctorate, he was employed as associate director of the Florida Legislative Bureau, after which he gained experience at the federal level as a management organization expert with the U.S. Bureau of the Budget. His formal academic career began with his appointment as lecturer at Harvard in 1954, but took off after he relocated down Massachusetts Avenue in 1957 to join the political science faculty at MIT. An impeccable scholar, Wood made a name for himself in the burgeoning field of urban studies through a succession of influential articles and books, most notably a challenging monographic on the phenomenon of suburbanization, Suburbia: its people and their politics (1959), earning promotion to full professor in 1962 and department chair in 1965. As his career accelerated, Wood increasing attracted the attention of politicians seeking to tap his expertise. Having advised John F. Kennedy on urban affairs during the election of 1960, Wood was rewarded with an appointment to the Committee for Economic Development in 1961. Lyndon Johnson selected Wood to chair the Task Force on Urban Problems in 1964, which recommended the establishment of the Department of Housing and Urban Development, and when that recommendation was approved, Wood was named the first Under-Secretary for HUD. During his time in Johnson’s cabinet, he was credited with helping to create the Model Cities Program (1966), which provided aid to poor neighborhoods, and for development of the Fair Housing Act of 1968, and he finished his tenure with a brief stint as Secretary of HUD during the closing weeks of the Johnson administration. With the changing political tide in 1969, Wood left public service to return to MIT, holding three positions simultaneously: as chair of the Political Science Department, as successor to Daniel Patrick Moynihan as Director of the Harvard-MIT Joint Center for Urban Studies, and as Chair of the Massachusetts Bay Transportation Authority. With his experience in Washington, he rose immediately to the top of the list to become leader of the University of Massachusetts, and in August 1970, he left MIT to take the reins as the first President of the UMass system, presiding over the chancellors of the campuses at Amherst and Boston and the new medical school at Worcester. Wood’s arrival at UMass came at an unusually tumultuous time, even for a tumultuous place, not only coinciding with the peak of growth for the university, but at the peak of student unrest over the Vietnam War and civil rights. Chosen by the Trustees because he was viewed as sensitive to students’ demands — “with it,” in the words of the day — but capable of wielding power when necessary, Wood soon found the need for all the political acumen he had gained in Washington. Greeted in office by a deluge of controversies, he found himself in the first year alone dealing with the fall-out from moving the President’s office to Boston; with the challenges of overseeing three independent chancellors and universities, navigating rivalries between the campuses and between the system and the state legislature; with the demands of managing the explosive expansion of academic programs and the equally explosive growth of student culture; and the need to fend off the continued efforts by the governor and legislature to seize control of the universities. Wood weathered the early storm and succeeded in many of his plans, including building the Columbia Point campus for UMass Boston and luring the John F. Kennedy Presidential Library there and building the medical school on a stable footing, but the unrelenting tensions over low levels of state funding and an often hostile faculty, who were making their first efforts at unionization, gradually eroded his base of support. After resigning from UMass in the summer 1977, leaving office on Jan. 1, 1978, Wood accepted an equally difficult position as Superintendent of the Boston public schools, assuming office at the time that U.S. District Court Judge W. Arthur Garrity had mandated the system’s desegregation. The position was no feather bed: Wood stirred opposition from the outset by hiring “idealistic out-of-towners” instead of selecting from within the system, and he faced not only the virulent backlash over busing, but a succession of labor disputes with teachers and workers in the schools. He was fired during the summer 1980, ostensibly over the system’s budgetary woes. During his career, Wood received his share of the accolades attending to a high profile academic life, including honorary degrees from St. Bonaventure, Pittsburgh, Princeton, Brooklyn Polytechnic Institute, Rhode Island College, Bridgewater State College, University of Maine at Presque Isle, University of Massachusetts, and North Adams State College, and awards such as the Wiener Medal in Cybernetics (1968). After a lengthy battle with stomach cancer, he died at home in Boston on April 1, 2005. He was survived by his wife of 53 years, Margaret Byers, and three children, Frances, Margaret (later to become the Governor of New Hampshire), and Frank. Visiting professor of public administration, Syracuse Univ. President, University of Massachusetts. Took office, July 1; Inaugurated Dec. 9. Includes resumes and summaries of Wood’s educational history, academic positions at Harvard and MIT, his position as under-secretary and secretary of the U. S. Department of Housing and Urban Development, and his memberships on boards and committees of U.S. and Massachusetts governmental agencies and educational organizations, as well as a bibliography of books and articles. Also included are several folders containing materials relating to Wood’s inauguration, some press material, and a small quantity of personal correspondence (the bulk of correspondence, consisting mostly of outgoing letters, is found in Series 2-5), along with selected writings, information about courses taught, and both notes for an oral historical interview slated for 1977, as well as a formal oral history conducted by Doris Holden on Jan. 27, 1989. The President’s Office files, the largest part of the collection, is arranged with subseries for office facilities, staffing and organization, “general” materials pertaining to operations, clippings, outgoing correspondence, appointment books, telephone logs, and records of travel. The first subseries includes materials on the various, often controversial, locations of the President’s Office after it was moved from the Amherst campus. Among other materials are blueprints and information on bids, leases, preparations, and furnishings, as well as some materials relating to the controversy with state government over the “exorbitant” rent costs in Boston. The second subseries includes content on the initial efforts to organize the new office, with descriptions of senior staff positions and material on the searches for candidates, along with some correspondence documenting the activities of individual staff members. Material (a partial record at best) regarding searches of the Amherst campus for senior administrators, faculty meetings, commencements and other ceremonial occasions. Information on conflicts with administrators, faculty, staff, and students are located in Series 7 (Restricted files). Material (a partial record at best) regarding searches of the Boston campus for senior administrators, the location of the campus at Columbia Point, and faculty meetings. Information on conflicts with administrators, faculty, staff, and students are located in Series 7 (Restricted files). Material (a partial record at best) regarding searches of the Worcester medical campus for senior administrators and faculty meetings. Subseries 1. National Organizations. Includes material on only two organizations with one of them being Department of Housing and Urban Development (HUD). Subseries 2. N. E. Organizations. Very incomplete as is apparent from the scattering of dates. Subseries 3. Committees and Boards. Has to do with President Wood’s personal activities as an on-going member of various foundations, institutes, and advisory committees. These papers were assembled from the chronological travel files so that all materials for each organization would be together. Subseries 1. Staff and Students. Includes confidential papers concerning administrators, faculty, staff, and students. Subseries 2. Recommendations. Letters of Recommendation. All-American City Award Presentation, Gardner, Mass. Alumni Congressional Reception, Washington D.C.
American Society for Public Administration Seminar for Academic Leaders, Washington D.C.
American Society of Newspaper Editors, Atlanta Conv. Conference Board, Northeast Conference, Woodstock, Vt.
Conference on Institutions of Higher Education Washington D.C.
Massachusetts State Transfer Articulation Comm. Mtg. National Housing Conference, Wilmington, Del. U.S. Congress, Joint Economic Committee Conference on the Crisis in American Cities Washington, D.C.
U.S. Dept. of Housing and Urban Dev. and Other Meetings, Washington, D.C.
University Heads Meeting with Senators Brooke and Mathias, Washington D.C. Processed by Virginia Conrad, 1986. Additional collections of Wood’s papers are housed in the John F. Kennedy Presidential Library in Boston, the Lyndon B. Johnson Presidential Library, and the Library of Congress. Cite as: Robert Coldwell Wood Papers (RG 003/3 W66). Special Collections and University Archives, University of Massachusetts Amherst Libraries.